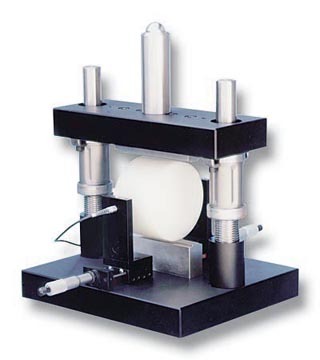 Facilitates Indirect Resilient Modulus Measurement of Asphaltic Concrete Specimens. The OEM Load Guide ensures accurate vertical compressive loading of your Asphaltic Concrete (AC) specimens for reliable Indirect Resilient Modulus Measurements. Linear ball bearing micrometer slides accurately position the horizontal displacement transducers (LVDTs). Precision linear ball bushings on rigid guide posts plus a single spherical ball contact point minimize off-axis loading. Stainless steel wave springs counter balance the upper loading assembly. No pulleys, cables, or counter weights! Select the optional Diametral Yoke for ASTM D-4123 modulus testing. To determine Poisson’s ratio, utilize the optional vertical displacement LVDT. Interchangeable Loading Strips accommodate both 100 mm (4 inch) and 150 mm (6 inch) diameter specimens.